When writing copy for the web, we always have a goal in mind--whether we recognize it or not. We most likely want our reader to do something, like look at a topic from a new perspective, make a purchase, identify with us, or even just to keep reading. Essentially, copy is writing that sells. So naturally, it should be compelling! No matter what your goal may be when writing for your blog or website, it’s important to look beyond just the facts and portray your information in an engaging, appealing, and well, compelling way. So what exactly do we mean by this? Compelling copy reaches your target audience in a meaningful way. It catches their attention and keeps it, and ultimately, it inspires them to act! Keep reading to learn 5 tips for writing compelling copy that converts. We all know how the saying goes...you have to put yourself in someone else’s shoes to really understand their perspective. While this might sound a bit cliché, it’s a key element of successful copy writing. Putting yourself in your reader’s shoes bridges the gap and allows you to connect with them in a meaningful way. For example, say your audience is young, female professionals who fall between the ages of 25 and 34, and they’re curious about what it takes to start their own business. When writing content for this audience, keep this at the forefront of your mind. How would a 29-year-old woman who’s an aspiring entrepreneur think? What answers is she searching for? What are her likes and dislikes? Where does she look for information? Asking yourself questions like this can tell you so many things as you go about crafting copy for your site. The key takeaway here is that while it’s tempting to write in a way that’s geared toward your own interests, remember that your readers’ interests come first--no matter what! 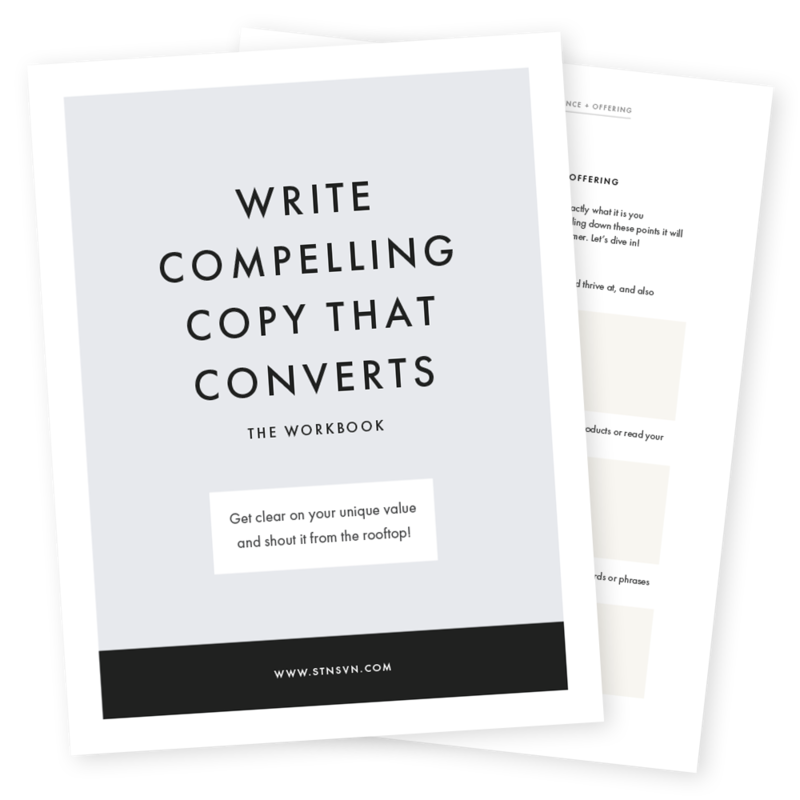 Be sure to grab our free workbook below so you can write your ideas down as you follow along. Get crystal clear on exactly who your audience is, what unique value you bring to the table, and how you can best communicate these points. When surfing the web, we want the answers we’re searching for to be presented in a clear, straightforward, and easy to understand way. If you had to choose between an article that’s 1,200 words long and one that’s 600 words long but provides you with the same amount of insightful information along with catchy headlines and graphics, which would it be? It’s safe to say that in most cases, people would choose the shorter, more concise article because it’s easier to digest. When it comes to effective copy writing, it’s best to skip the fluff. Even though you might be passionate about the topic and want to pour your heart out on the page, this has the potential to overwhelm your reader. So, go through your writing and see if there’s a simpler way to communicate what you’re trying to say. A great tip is to have a friend or coworker go through your writing and see if there are areas you can condense or be a little more straightforward. Get clear on your biz + craft killer copy! Now, we’re not saying to cut yourself short or not share all of the information you want to. It’s not necessarily about sticking to a specific word count, but rather, it’s about how you present your information. There is a way to create information-rich pieces that are also easy to comprehend. Try breaking up large paragraphs into smaller ones, adding a bold headline here and there, and maybe even creating a graphic that communicates your message. Get creative and have fun with it! Trello does a great job of communicating their value in a short and sweet, easy to understand way. When landing on their homepage, you immediately get a feel for what type of company they are and what they offer! What can you offer that no one else can? Why should people listen to you over a competitor? Keep these things in mind when creating copy. If you fail to differentiate yourself, you’re less likely to make an impact on your reader. So how can you do this? A great way to establish credibility is to reflect on personal experience. Yep, that’s right! Stories are great because they allow your audience to connect with you, but they also give you a chance to show that you know what you’re talking about. Maybe you want to share your experience with starting a business and the challenges you've overcome along the way. This is likely to intrigue your readers and make them see you as a credible source for entrepreneurial advice. It’s a win-win! Ever landed on the homepage of a website and left immediately because the writing was just, well...bleh? Or maybe you’ve read a product description on an online shop and just didn’t feel convinced. In both of these cases, what you were reading most likely lacked personality! Sure, the facts might have all been there, but you weren’t actually convinced to act. When it comes to creating copy, view it as your chance to showcase your brand’s personality. Is your company fun, lighthearted and witty? Are you known for being humorous? Or, maybe your brand’s voice is professional and serious. The copy on your site needs to match! This will help you communicate a consistent brand message, which is key when you want to convert followers into loyal customers. Last but certainly not least, it’s important to end on a high note! You’ve communicated your message through compelling copy, and now it’s time to come out and ask your reader to act. Just like in everyday life, when you want something, you ask for it. It shouldn’t be a shameful thing! 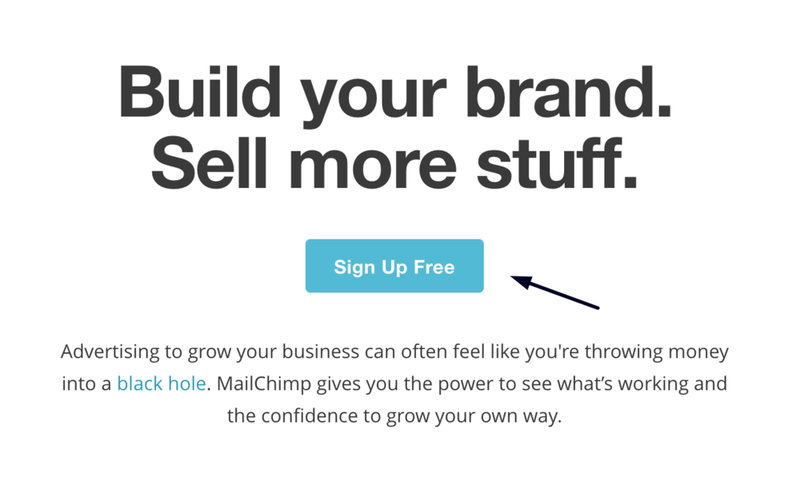 If you’re confident in the value you provide and have a well-crafted call-to-action (CTA), it’s likely that your reader will opt-in and take that next step with you. Whether you want your reader to learn more about a product, make a purchase, or simply sign up for your blog newsletter, you have to ask. Now, it’s important that when you ask the question, you don’t stick to the generic CTAs like ‘Sign Up Here’ or ‘Buy Now.’ Instead, get creative. What’s the benefit of readers opting in? Are you offering a free trial? Be sure to emphasize the fact that it’s FREE! Will they receive what they’re opting in for instantly? Make sure they know that they can ‘Get It Sent to Your Inbox.’ Remember, it’s all about emphasizing the value of saying "Yes!" At the end of the day, it’s important to make your copy work for you. Always keep your goals in mind and if something isn’t working, change it up and try something new! Do you have any additional tips for writing effective copy? We’d love to hear them in the comments below!